This report covers supply and demand for linear alpha-olefins (LAOs) with carbon chain-lengths of four (butene-1) and higher. Most of the current commercial LAO plants produce a broad range of even-numbered alpha-olefins based on ethylene oligomerization. However, on-purpose technology for the production of butene-1, hexene-1, and octene-1 (included and increasingly important) will continue to be vital in meeting the polyethylene comonomer supply gap that will continue to grow given the divergence in growth rates among polyethylene comonomers (the major LAO consuming market), polyalphaolefins, and more specialty applications. Butene-1 that is produced from raffinate is also included. 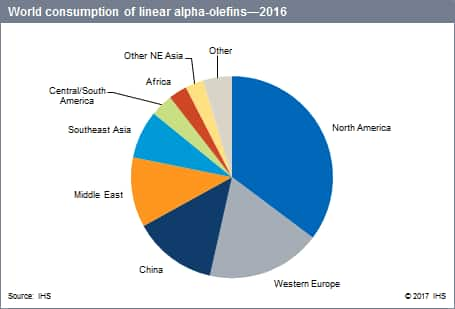 Global consumption of LAO during 2012–16 grew at an average annual of rate of 5.6%, driven by polyethylene comonomers, detergent-range alcohols (based on linear alpha- and internal olefins), polyalphaolefins, oil field chemicals, and surfactants. In 2016, North America accounted for almost 40% of the world production of LAO, followed by the Middle East (19%), Western Europe (16%), China (10%), the rest of Asia, Africa, and Central and South America. In addition to some capacity expansion for full-range LAOs, the majority of new capacity has been for on-purpose technology for the production of hexene-1 and octene-1. The continued North American abundance of shale-based natural gas and the need to meet the polyethylene comonomer supply gap have driven this growth. The low cost of ethylene in North America is driving several investments in the region. Most of these capacity additions are for polyethylene. However, polyalphaolefins and oil field chemicals are also contributing to this growth. The polyethylene comonomer supply gap will continue to grow given the divergence in growth rates among polyethylene comonomers (the major LAO consuming market), polyalphaolefins, and more specialty applications; the need to fill this gap will lead to capacity additions for both on-purpose LAO capacity (30% of the total additional capacity) and full-range LAO capacity (70%) in North America. Approximately 55% of the announced global LAO capacity additions (for commencement in 2018 and beyond) are for full-range LAOs. However, on-purpose LAO capacity has grown significantly in the last few years, and this on-purpose technology for the production of butene-1, hexene-1, and octene-1 will continue to be vital in meeting the polyethylene comonomer supply gap. World consumption of LAOs is forecast to grow at an average annual rate of 3.7% during 2016–21. Forecasts of growth rates vary significantly by region and by LAO cut. Annual growth during 2016–21 is expected to average approximately 5% in North America and China, 0.5–1.0% in Western Europe, and 4% in the rest of Asia (with India and Southeast Asia driving regional growth). In the developing regions, annual consumption growth is forecast to average 13% in Central and Eastern Europe (from a small base) and 3.0–3.5% in the Middle East. Central and South America will likely experience only modest growth given the current sluggish economic conditions, the lack of increased polyethylene (LLDPE) production until 2020, and declining HDPE production. However, regional consumption of LAO for oil field chemicals is expected to grow at a healthy rate during 2016–21, offsetting some of the expected decline for polyethylene. Growth for comonomer-grade LAOs is expected to be considerably higher in North America (7.2%, and from a large base), where the region has a low-cost ethylene feedstock advantage. Other regions with comonomer-grade LAO growth rates exceeding 4% include China, Central and Eastern Europe, Africa, India, and Southeast Asia.